The Japanese giant hornet is large and fearsome, but it is not particularly aggressive unless it feels threatened. It has a venom which is injected from the 6.25 millimetres (0.246 in) stinger and attacks the nervous system and damages tissues of its victims. 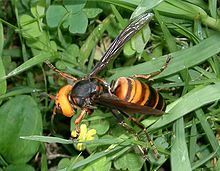 The Japanese giant hornet (Vespa mandarinia japonica), is a subspecies of the Asian giant hornet (V. mandarinia). It is a large insect and adults can be more than 4 centimetres (1.6 in) long, with a wingspan greater than 6 centimetres (2.4 in). It has a large yellow head with large eyes, and a dark brown thorax with an abdomen banded in brown and yellow. The Japanese giant hornet has three small, simple eyes on the top of the head between the two large compound eyes. As the name implies it is endemic to the Japanese islands, where it prefers rural areas where it can find trees to nest in. In Japan it is known as the Oo-Suzumebachi (オオスズメバチ（大雀蜂、大胡蜂）?, literally "Giant Sparrow Bee"). Although I've seen these before here, they haven't been around in a few years. I think it may have something to do with it being such a dry year. I hate them and try to keep the dogs away from them. The Pres was once stung by one on the top part of his hand. It was swollen and numb for days! They have been savoring the sugar water for my Hummingbirds as well as the sap on the apples. I had never seen one until one got caught in between one of our windows and the screen this summer. Needless to say, it wasn't happy!! Its size made me nervous but I managed to pop the screen out of the window so it could makes its escape. I looked them up online and found they were something to not fool around with--I could tell by the size that it wasn't. But I read they can totally destroy an active beehive....YIKES!!! Well, they're fearsome looking things. Just tell them that it's much too cold for them to migrate up North, would you? They once moved into a stump we had. Nasty little things. My grape jelly feeder I had out for the Orioles was covered with honey bees and bumble bees.. They stung me and my wrist looks like a giant bubble and itches fiercely~! IT's been so dry here that is why they were so busy eating the jelly. We had 4 inches of rain and so far they haven't come back for more jelly.. It's out there for them. Have a tiggeriffic day..be careful~! My mom has some of these by her deck and they will not allow you to enjoy even a few minutes of peace. I have seen a documentary on them and they can kill people. They are much larger than the Killer Bee. I didn't think they were here yet? last year when we went camping to alabama...there was a nest of them right outside the back of the camper...i felt trapped inside...they kept buzzing around the back door. i was SHOCKED...(and scared!) had never seen such a HUGE wasp/hornet before...and had no idea what they were...not til we got home and i could look them up! we ended up moving to another camping spot!